Presents and surveys research described in literature between December 1999 and November 2000. 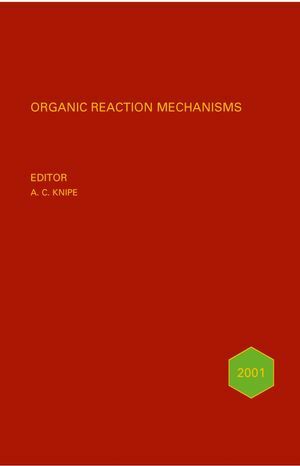 As in previous volumes new mechanisms for the synthesis of all types of organic compounds will be included as well as such mechanisms as addition and elimination reactions, nucleophilic and electrophilic aromatic substitutions and molecular arrangements. 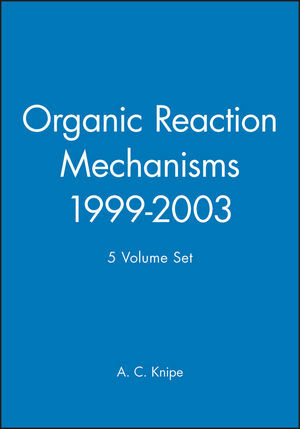 This annual series on organic reaction mechanisms reasearch provides concise and comprehensive coverage of the years literature as well as discussions on important results. Each volume is extensively referenced to previous volumes and primary journals. Professor A.C. Knipe, School of BMS, The University of Ulster, Northern Ireland. 1. Reactions of Aldehydes and Ketones and their Derivatives by B. A. Murray. 2. Reactions of Carboxylic, Phosphoric, and Sulfonic Acids and their Derivatives by C. T. Bedford. 3. Radical Reactions: Part 1 by A. J. Clark, J. V. Geden, and N. P. Murphy. 4. Radical Reactions: Part 2 by A. P. Dobbs and T. C. T. Ho. 5. Oxidation and Reduction by D. C. Braddock. 6. Carbenes and Nitrenes by D. M. Hodgson, M. Christlieb and E. Gras. 7. Nucleophilic Aromatic Substitution by M. R. Crampton. 8. Electrophilic Aromatic Substitution by R. G. Coombes. 9. Carbocations by R. A. McClelland. 10. Nucleophilic Aliphatic Substitution by J. Shorter. 11. Carbanions and Electrophilic Aliphatic Substitution by A. C. Knipe. 12. Elimination Reactions by A. C. Knipe. 13. Addition Reactions: Polar Addition by P. Ko&ccaron;ovsk&yacute;. 14. Addition Reactions: Cycloaddition by N. Dennis. 15. Molecular Rearrangements by A. W. Murray.